After India’s victory in the India vs Australia five ODI series, the chariot was stopped. 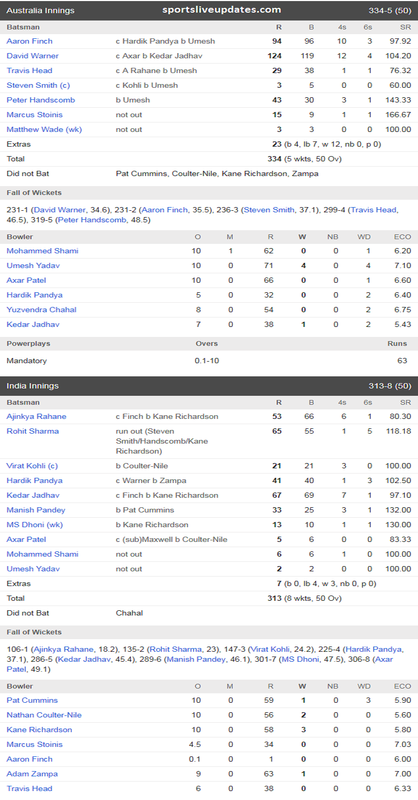 Indian team lost by 21 runs in the India Vs Australia 4th ODI played at Bangalore’s Chinnaswamy Stadium. Australia batting first, India was given the target of 335 runs in the India Vs Australia 4th ODI, in reply to which India could score 313 runs. In the victory of Australia, David Warner scored a magnificent 124 runs and became the Man of the Match. Aaron Finch also contributed 94 runs. Bowler Ken Richardson also hit three wickets on important occasions. Team India, though, has made an unbeatable lead in the series and has won the India Vs Australia first 3 matches of the series, but Team India has suffered the biggest loss since the India Vs Australia 4th ODI. Australia won the toss and chose the batting and Warner-Finch’s salute pair proved their captain’s decision correct. This pair made the record for the biggest partnership for the first wicket in India Vs Australia 4th ODI Match. With the partnership of 231 runs for the first wicket between David Warner (124) and Aaron Finch (94), Australia made a huge goal of 335 runs against India. Warner, playing his 100th ODI, faced 119 balls 12 fours and four sixes. Along with that Warner became the first Australian and the eighth batsman in the world to score a hundred in ODIs. After his departure Finch also returned to the pavilion. Umesh Yadav caught Finch at Pandya’s hands. Captain Steve Smith made three runs. From here the Australians have lost the rhythm of the team and the goal they were going to go was far behind. In the end, Peter Handscomb played in 43 runs with three fours and one six in 30 balls. Marcus Stoinis remained not out after 15 runs in 9 balls. Umesh took 4 wickets from India. Jadhav got one wicket. Rohit and Rahane gave a commendable start to the chasing the huge target in India vs Australia 4th ODI and 106 run partnership for the first wicket in 18.2 overs. Rahane became a victim of Ken Richardson shortly after completing the half-century. Rahane hit six fours and a six in 66 balls. After a while Rohit and Virat Kohli got misunderstood in taking runs and Rohit run out. Rohit 65 runs played 55 balls in his innings and made five fantastic sixes. Kohli (21) bold on Nathan Coulter ball, the total score of 147, India lost their three main batsmen. Hardik Pandya (41) and Jadhav, who are running in the best form from here, took the team and 78 runs for the fourth wicket in the India Vs Australia 4th Match. Pandya once again made leg spinner Adam Zampa his target, but Zampa caught him in the 38th over. Jadhav then struggled to win the team with Manish Pandey (33), but both of these players failed. Jadhav, who hit seven fours and a six, faced 69 balls and returned to the pavilion in the 46th over. Pandey was out in the first ball of 47th over. Mahendra Singh Dhoni tried to win a four and a six in 10 balls, but Richardson finished his innings in the 48th over in India vs Australia 4th ODI Match. Team India made the world number one ODI team by winning the India vs Australia 3rd ODI, but lost in India vs Australia 4th ODI Match, losing its number 1 chair. The South Africa team once again became the number one team when India lost the India vs Australia 4th ODI Match, while the Indian team slipped to number two. By the way, both Africa and India have 119-119 points but the Virat army has lagged behind with decimal points due to defeat in India vs Australia Bangalore. With the loss in India vs Australia 4th Match, Team India also lost the opportunity to Clean Sweep the Australian team. Team India never did a clean sweep of Australia in ODI history. By the way the team won the India vs Australia first three matches of the series, it was felt that the Indian team could also take Australia’s clean sweep under the leadership of Virat but it did not happen. Team India, led by Virat Kohli, had won 9 consecutive ODIs and had the chance to win 10 consecutive wins for the first time in Indian cricket history, but this could not happen. With the loss in India vs Australia 4th ODI Match, he also lost his dream of winning 10 consecutive matches. Let us tell you, Team India also won 9-9 ODIs, led by MS Dhoni and Sourav Ganguly. Team India has not lost the last 13 years at the Chinnaswamy Stadium in Bangalore. Since 2004, Team India had played 8 matches here and did not see the defeat. But this series of victory was broken by the Australian team.